Having a baby can be so scary am I right? There are so many things to think about and to plan for. So many questions you will have to answer. Cloth or disposable diapers? Baby-led weaning or starting with purees? Find out the gender early or be surprised? Seriously I could list questions that come with those two pink lines for days. There are so many things that you don’t ever consider until you get pregnant and have a baby. My husband really wanted to find out the gender of our first child early and I didn’t have a strong preference in the other direction so we found out early. It was really fun to hear ‘it’s a boy!’ And, finding out early let us plan how we wanted to design the nursery. There are so many adorable ideas for nurseries that I have seen, these are just a few of my favorite baby boy nursery ideas. According to the American Academy of Pediatrics the safest way for your baby to sleep is in a crib with only a fitted sheet on the mattress. There shouldn’t be any loose blankets, toys, bumper pads or anything extra in the crib; just a plain crib, with a mattress, and a fitted sheet. So just keep that in mind when you are designing the nursery. This was my absolute favorite nursery theme idea. I used this theme for my son’s nursery. When I was pregnant with my son he was constantly moving and kicking. At the 12 week ultrasound, it took almost two hours to get the images the tech needed because my son was jumping all over the place. I don’t know what I was expecting during that ultrasound but seeing my little baby moving all over and being so active was amazing. As a result, we decided he needed a nursery theme to match his rambunctious personality so we decided to go with an Adventure theme. We filled his room with maps, mountains, adventurous animals, and anything that seemed to scream ‘adventure’. I lived in East Village, New York for a little while and it is my favorite place that I have ever called home, so I found a map that showed that section of Manhattan and another map that is a large wall map of the entire world. I also bought a mobile with sailboats on it and a crib sheet with a map. Above the doorway, I found a print that says “Adventure Awaits.” I also bought my little explorer a teepee to put up when he is a little bit older. There are so many directions you can take with an Adventure theme. I love how versatile it is to match your baby’s personality perfectly. Kids love animals! Some of my son’s first real communication was when he learned what a lion was and what sound it makes. It is adorable and I love asking him “William, what sound does a lion make?” to hear that little tiny roar come out. It’s like a scene from the Lion King when Simba is just a cub. So having a Zoo theme is an awesome nursery idea, and I have yet to meet a child who doesn’t love animals. I saw these really adorable felt animal heads that stick out of the wall and they would be perfect for a Zoo-themed nursery. Something that they have at our local zoo, that is adorable and children love, is a zookeeper station where the kids can pretend to be a zookeeper or a vet and they have all the pretend equipment. There are costumes for the children and play medical equipment to help the (stuffed) animals feel better. I know this will be wasted on a newborn but your baby will grow up in the blink of an eye. I’ve also seen a “zoo cage” to keep all the baby’s stuffed animals in. It is just the frame of a wooden box with rope connecting the top to the bottom to represent the bars. It is an adorable way to keep the toys contained and the nursery clutter-free. The zoo cage is also a fun way to teach your child to help clean up once play time is over. You can embrace their imagination by having your child help put all their animals to sleep back in their cage. I have a Bachelor’s degree in Biology and a Masters of Public Health. Needless to say, I am a science geek through and through and think that ‘Science’ would be an awesome theme for a nursery. I love the idea of putting pictures of Nobel laureates and famous scientists like Madame Curie as framed pictures on the bookshelf or dresser. Having framed pictures of molecules like chocolate would add a fun playful science touch. The periodic table of elements, either in color or black and white, painted across one wall is unique and hopefully inspires curiosity and learning. 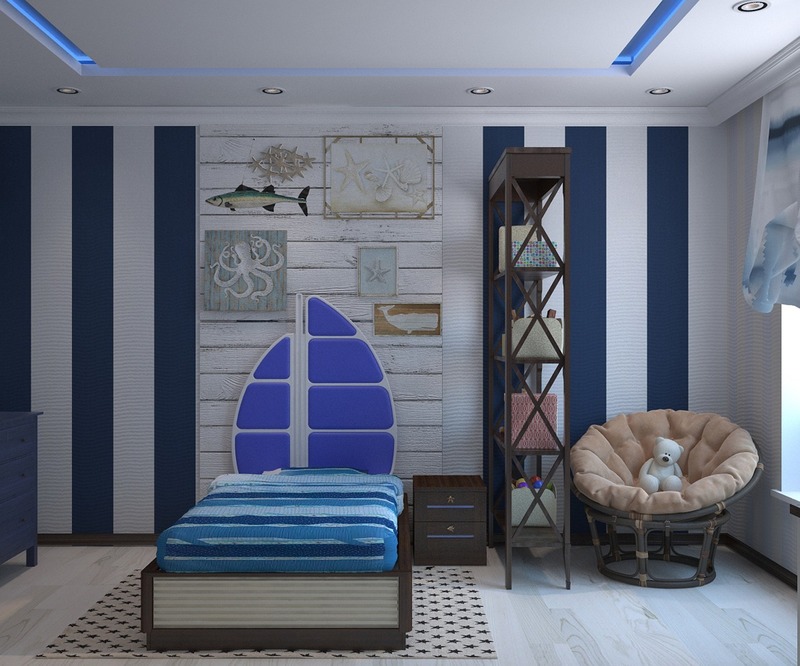 An Ocean theme is so tranquil and will bring soothing vibes to your son’s nursery. You can paint the walls a tranquil blue or with an ocean floor mural. The mobile can be made from dolphins, starfish, and suns. The dresser handles can be sand dollars. The crib sheets can be a seascape or a treasure map. There are so many things you can do with a bookshelf in a baby boy’s nursery with an ocean theme. You can make a bookshelf in the shape of a rowboat, or a seashell. You can also make the bed a “ship” to ignite your child’ imagination. Using driftwood from your favorite getaway to make a shelf will add such a personalized touch to your little angel’s nursery. From an Etsy shop called MeetMeByeTheSea, there is a sign that reads “beach baby (v) a salty little sweetheart with sandy toes & a sunkissed nose” which would make an adorable and perfect touch for an ocean-themed nursery. You don’t have to stick to just various shades of blue for an ocean theme either; you can also use oranges, yellows, greens, the possibilities are endless. And as a bonus, add an adorable newborn picture. They sell baby outfits that make them look like a starfish! I just found out our second child is also going to be a boy and I can’t wait to decorate the nursery with a Space theme. There are so many adorable decorations you can find on Etsy, Hobby Lobby, Target, and Amazon. Target has an adorable teepee that is shaped like a rocket ship that I can’t wait to hang in the corner of my son’s nursery. You can bring a Space theme into all parts of a nursery from the mobile to the walls or even the bedding. My absolute favorite thing I am going to do in his nursery is paint the ceiling with glow-in-the-dark white paint like the night sky the day he was born. If you are a sci-fi fan you can bring in aspects of your favorite show or movie. Maybe have a Millennium Falcon figurine on the bookshelf. Or a framed print of the Enterprise. I love the idea of using the solar system for a mobile. Your baby will know to reach for the stars with all of his dreams. This theme also transitions well once your little one gets older. My husband doesn’t know it yet, but he will be making a spaceship bedframe for the newest member of our family to transition him from a crib to a toddler bed. Decorating a baby boy’s nursery with aviation will bring an uplifting and “the sky’s the limit” feeling to your baby’s world. Painting the ceiling like a sky with puffy white clouds and having a ceiling fan that looks like an airplane propeller would add a cheerful and beautiful touch to your son’s nursery. A mobile with planes would entertain your son all day. I would love to see a newborn photoshoot where the baby is dressed in an aviator jacket. Using an old school aviation helmet as a prop would add the perfect touch. Or if the baby’s mother or father is in the Air Force, using the parent’s uniform for a plane-themed newborn shoot in their nursery would be so incredibly beautiful. There is no shortage of Aviation-themed decorations that are safe for you to fill the nursery with, that your son will also love. Little boys tend to roll, crawl, climb and jump all over their nursery as soon as they become mobile. So, a Monkey theme would be perfect for a little boy’s nursery. My son was given a basket that says “five little monkeys” on the side of it and I love it! Inside it came with a stuffed monkey that has a bell in the middle and my son adores it! When he sees it he calls it “ha ha ha” because that is how he mimics the sound a monkey makes. An adorable touch that I saw on Pinterest is using monkeys as a curtain tie to hold the curtains to the side and it looks like the monkeys are climbing up the curtains. It is seriously adorable. A rustic log cabin theme is a great way to start your little guy’s life of adventure in the mountains. Flannel and pine tree pictures on walls can give the room a rustic feeling. Imagine feeling like you just walked into a cabin in the middle of Grand Teton National Park in Wyoming. Ansel Adams photography can fill the room with beautiful pictures of national parks. A mobile with bears, mountains, and lumberjack would be perfect rotating over the crib. The color possibilities can really make the room feel warm and inviting, inspiring a sense of adventure and a love for the outdoors. A nursery theme that would even make Teddy Roosevelt proud, the possibilities for this room are endless. The colors you choose for your baby’s nursery can affect their temperament. According to projectnursery.com every color has a different effect. The color red should be avoided as a wall color because it brings out the more aggressive side of a baby. But, using red as an accent color can bring out your baby’s passion and excitement. I think having a red glider chair or curtains would be great if paired with a gray colored wall. The color orange brings a welcoming feeling to your son’s nursery and brings in a fun, modern feeling. Avoid bright oranges but a dark or burnt orange will bring in a comforting and warm feeling to the nursery. Orange would be perfect for an autumn baby and bring in the beautiful colors of fall. The color yellow makes me think of summer and sunshine. It is a beautiful happy color but can quickly become overwhelming so use it sparingly. A nice soft pastel yellow would bring in a soft cheerful energy to your son’s nursery and will promote concentration. The color green makes me think of nature, rolling hills, beautiful forests, and meadows. Using green in a nursey will help your baby get restful sleep and reduce their anxiety. This is a color that is so versatile and can be used in so many shades. You can use it as the main color for a nursery or as an accent. Using green to paint a beautiful forest mural as an accent wall would be beautiful. If you want your son’s nursery to promote positive energy, then blue is the perfect color to use in the nursery. Light blue is great for restful sleep while bright blues are good for energizing your baby. Using a light blue for the crib sheets and decorations is a great first step for great sleep. Using bright blue colors in the play area of the nursery is a great way to energize your baby for tummy time. Choosing a theme for the nursery should be a priority that you put careful consideration into making. The best themes can evolve with your child as they grow so you aren’t gutting and repainting every few years. I hope you liked my favorite baby boy nursery ideas and have fun planning your little one’s nursery!